I miss my parents’ cooking. As children, my brother and I used to whine about how our friends got to eat out at fancy places… you know, places like McDonald’s and CiCi’s pizza. Yah, yah, I know… we were kids and didn’t know any better. We routinely had our family dinners at home and you would find my mom, dad, or both of them clinking, clanking, and tsza-tszaa-tszaaaaaing away in the kitchen. Mmmm, the smell of nostalgia. So yesterday, I had a hankering for some Chinese steamed buns called Man Tao. Unfortunately, I didn’t know how to make it and my mom was on a plane somewhere over Ohio or something. Oh well, google it. In my desperate search for authentic Man Tao, I came across another childhood favorite. Hua Juan. 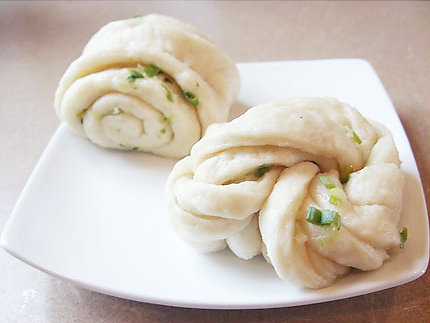 It’s essentially the same as Man Tao, but with green onions and twisted into a pretty flower roll giving it its name. It took almost five hours from beginning to end but the result was well worth it. Place the yeast in a bowl and pour the warm water over. Stir in the sugar to dissolve. Let stand for 15 minutes. Sift the flour into a bowl. Add the yeast and water mixture and begin stirring immediately. Keep stirring until you have a dough that holds together and doesn’t stick to the sides of the bowl. Adjust the amount of water, adding more or less as is needed. Turn the dough out onto a lightly floured surface, and knead until it is smooth and elastic (about 10 minutes). Add more flour or water if needed. Cover and let rest for 1 1/2 hours. Punch the dough down again, and let it rest for 1 – 1 1/2 more hours, until it’s size has doubled. Dissolve the baking powder in 2 teaspoons water. 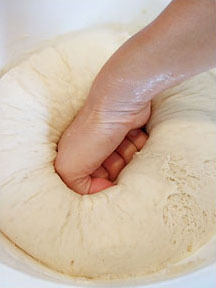 Knead into the dough vigorously for a few minutes, until it is elastic again. Begin preparing the flower rolls. 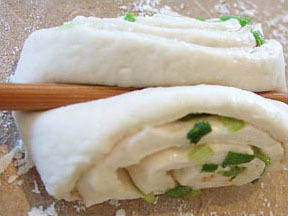 To make the rolls, roll out the dough into a large rectangle, Rub the sesame oil over. 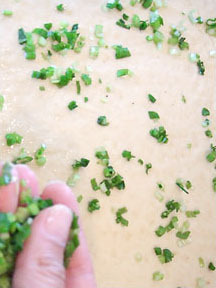 Sprinkle evenly with the salt and chopped green onions. 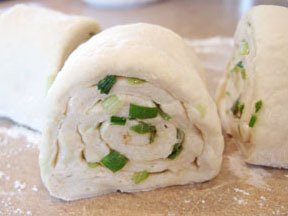 Roll up the dough as if you were rolling up a sleeping bag and cut into 2-inch pieces. Take each piece and, with the cut sides facing outward, use chopsticks or something similar to press down lengthwise in the middle. Press down firmly enough so that the layers on each side spread outward, but not enough to cut right through the dough. The layers will push out to the sides, so that you have 2 ovals that are joined in the middle. 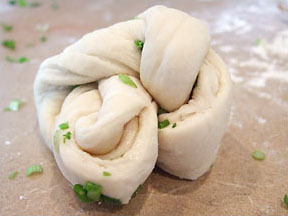 Pick up the dough by its rounded ends, and pull until they meet underneath the roll. PInch the ends together underneath the roll. This causes the flower to become rounder in shape. Let the rolls sit for 10 minutes, and then steam for 20 minutes. 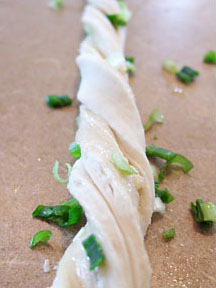 Another way to prepare the flower roll is to roll out the dough into a large rectangle and cut them into 4″-5″ strips. 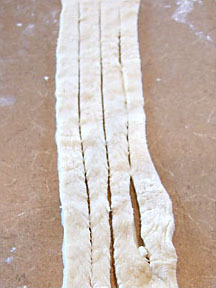 Then slice several lengthwise slits leaving the ends intact. Rub sesame oil all over and sprinkle salt and green onions all over. 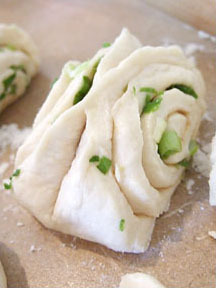 Then take the short, intact ends and twist the dough. Take the ends and tie a knot tucking the ends at the bottom of the roll. Like the other style, let sit and then steam.